This most interesting surname is of Anglo-Saxon origin, and is a locational name from Aisthorpe in Lincolnshire, which was recorded as "Aestorp" and "Estorp" in the Domesday Book of 1086 and "Esttorp" in 1115, in the Lincolnshire Survey. The placename itself is composed of the Olde English elements "east", east, and "thorp, throp"; the probability is that a "throp" or "thorp" was a dependent farm, an outlying dairy-farm belonging to a village or manor, and very often placenames ending in "throp" or "thorp" have a first element meaning "east, west, south or north", as in, for example, Astrop, Westrip, Eastrip and Southtrop. Locational surnames were developed when former inhabitants of a place moved to another area, usually to seek work, and were best identified by the name of their birthplace. One John Aisthrope, son of Christopher Aisthrope was christened on September 20th 1600 at Lea, Lincolnshire and Willmus, son of Willimi Aistrop was christened at Hanswell, Lincolnshire on September 2nd 1604. 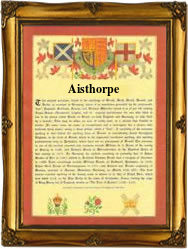 Thomas Aisthorpe was christened on August 14th, 1605 at Lea. The first recorded spelling of the family name is shown to be that of John Ashthropp, which was dated June 24th 1598, marriage to Mary Stamper at St. Swithin, Lincoln, during the reign of Queen Elizabeth 1st, known as "Good Queen Bess", 1558 -1603. Surnames became necessary when governments introduced personal taxation. In England this was known as Poll Tax. Throughout the centuries, surnames in every country have continued to "develop" often leading to astonishing variants of the original spelling.